Quality Products .... Dependable Service! Since 1977, GarzoTire has been providing customers with a level of value that exceeds their expectations. Our family-owned business operates with honesty and integrity; with a constant focus on improving our service. GarzoTire's main office and warehouse facilities are located at 201 Demorest Street in Terre Haute. 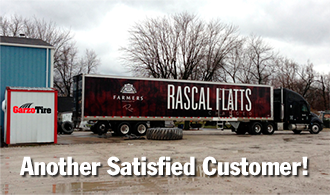 We maintain a considerable inventory of farm and commercial tires on-site for immediate delivery.